Finally, assembly... and confirmation of non-embarrassing results. Microscope! Now With More Spacer Action! There's one thing left to worry about. 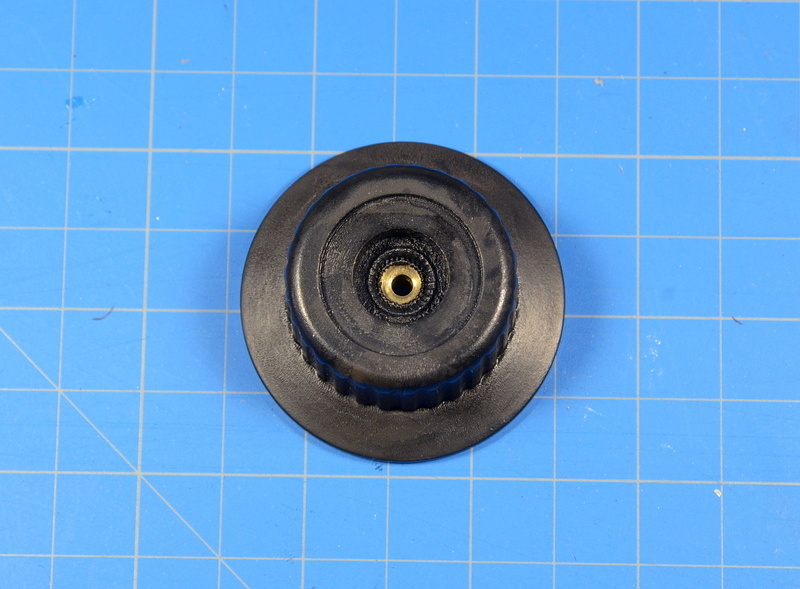 The left hand focus knobs are, for whatever reason, set in toward the centerline of the focus block about a quarter of an inch compared to the right. The coarse knob almost-- but won't quite-- clear the SZH's uniquely wide microscope body. OK! First I need a ring spacer to set the coarse focus knob further away from the centerline. Done! Now, the fine focus knob needs to be set away as well. 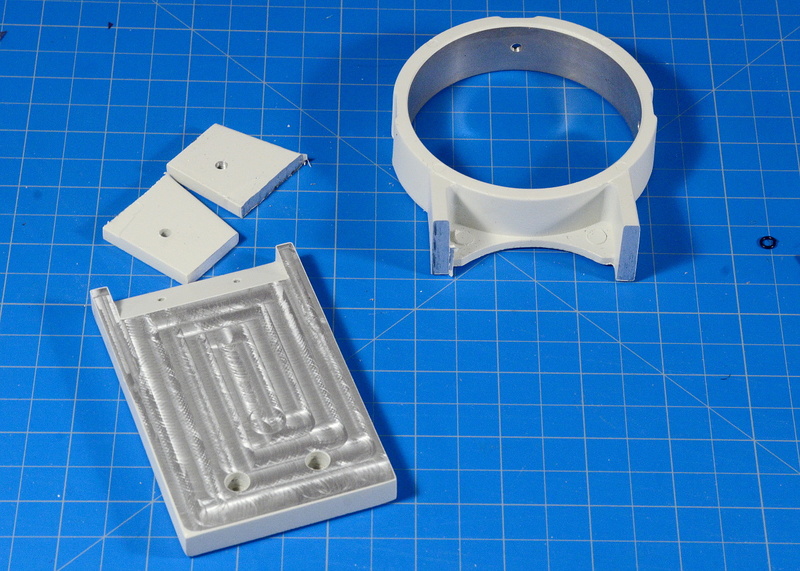 I considered making a shaft spacer, but it will weaken the overall assembly. 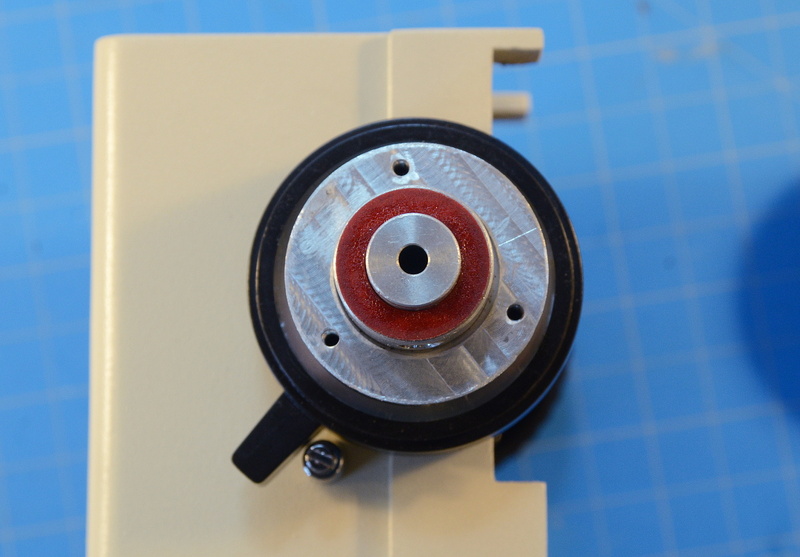 Instead, I heated the brass inset in the fine focus knob until the ABS softened, then pushed it in 80 mil. I did use a guide to make sure it pushed in straight and flat-- no wobbling allowed. The fine focus also has a spring-loaded friction mechanism to add a little resistance to it drifting. One side is built into the knob, which I just moved out 80-mil. So I need an 80-mil spacer to take up the slack. Don't worry, the hammer in the background is a specially designed precision optics hammer. And a Micromill ain't no toy. End result has to work exactly as intended. No half-functional hacks. The end result must look professional, bordering on factory quality. 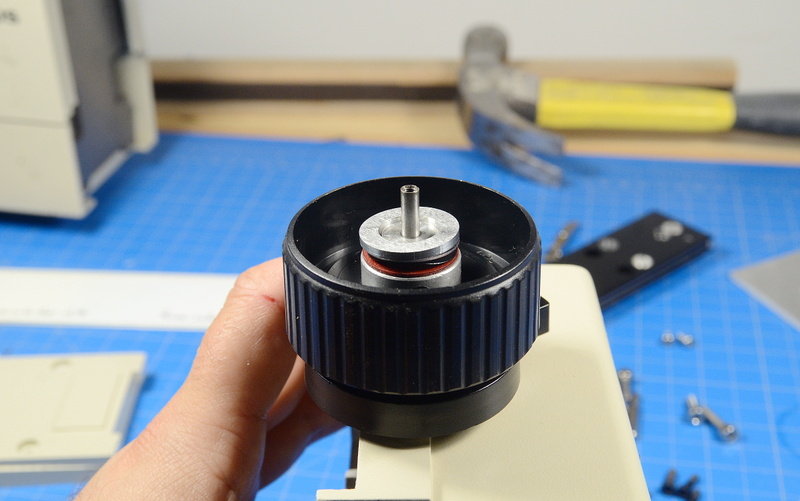 My original plan: Remove the microscope body mount from the block's dovetail, cut the ring part off, machine the remaining bit flat and add some additional bolt holes to secure it to the SZH. And that kinda sorta works! 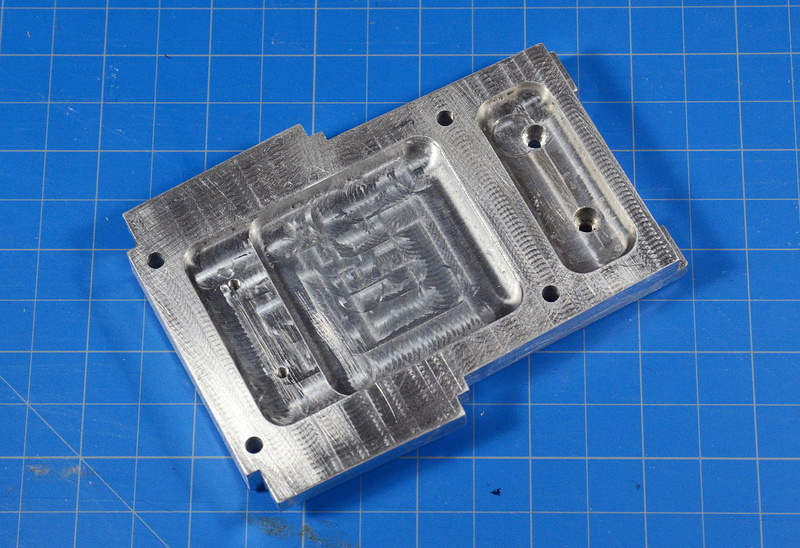 Unfortunately, the remaining block is not quite deep enough for the adjustment knobs to clear, nor is it tall enough to reach all four mounting holes on the back of the SZH body. That means I need to machine a spacer that would have to bolt to the mounting block, then those two pieces could mount to the dovetail and the scope. Then I thought 'what am I doing? ', chucked it, and grabbed a piece of aluminum that's actually the right size to start with. So let's do this part again. 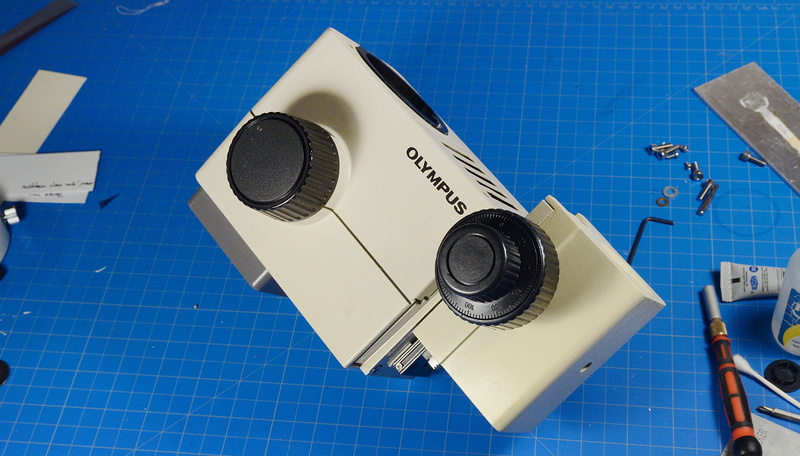 Sadly, no Chinese manufacturer to date has cloned an SZH, but there are clones of other Olympus focus blocks. None of these will fit as-is of course, the SZH is weird. But several look to be moddable with a little effort. So I chose a clone of a nicer Olympus coarse/fine assembly.